Please save the date for Circle of Dreams 2019! 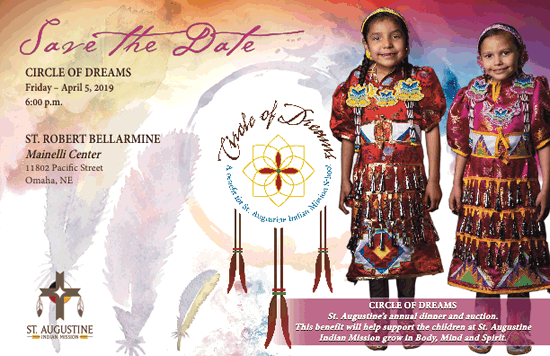 Circle of Dreams is St. Augustine’s annual fundraising dinner and auction. All proceeds to support the education of students from the Omaha and Winnebago reservations who attend our school. If you have questions or wish to donate an auction item, please contact Peggy Tabor at 402-557-5652. St. Augustine Indian Mission School is a member of the American Indian Catholic Schools Network and partner of the University of Notre Dame's Alliance for Catholic Education. Our school provides a challenging, faith-filled, educational experience that serves as the foundation for a life lived in service to Jesus, the Church and Community.